London's magical Christmas markets and festive fairs are worth wrapping up warm and stepping outside for, with tempting food, warming cocktails and the chance to turn Christmas present shopping into a fun day out rather than a dreaded chore. The ever-popular market returns along with festive shows and family fun. Two brand new family shows are at the heart of this year's Winter programme at the Southbank Centre. The award-winning puppeteers from War Horse present the European premiere of Circus 1903 and two Australian theatre companies perform the UK premiere of Rumpelstiltskin, mixing music and silliness and starring cabaret legend Paul Capsis. There's more festive family fun with a sing-along version of Julia Donaldson & Axel Scheffler's Zog & Friends Show, That Night Follows Day by Forced Entertainment and Maureen Lipman's Up for It. The entire 21 acre site is transformed into a winter landscape with the Winter Market, illuminated rooftops, choirs, carols and classical music - highlights include the return of Handel's Messiah and Christmas at the Movies. Tango classes, swing dancing, ballroom lessons, a day of drag kings and queens and a Caribbean Christmas Party are among the free events and it all comes to a big finale with A Vintage New Year's Eve Party where you get fantastic views of the London fireworks. Christmas comes to the heart of London with a traditional market and festive entertainment. The festive feeling returns as Christmas in Leicester Square transforms the famous square in the centre of London into a wintery wonderland. There's a traditional Christmas market with stalls selling hand-crafted goods and delicious food and drinks. The man with all the presents takes up residence in Santa's grotto where children can meet the man himself, plus there's a whole host of shows in the beautiful surrounds of a traditional 1920s spiegeltent. Frisky & Mannish, Monski Mouse, the Briefs boys and the House of Burlesque are just four of the acts lined up. It's organised by Underbelly who helped develop Winter at Southbank Centre and who are best known in London for their Wonderground festivals on the Southbank. Top London restaurants and talented chefs come together under one roof. The winter edition of Taste of London presents 19 of London's top restaurants and a host of talented chefs under one roof for a festive treat at Tobacco Dock. New for this year are seven brand new restaurants, masterclasses at the new Urban Kitchen, wine and cheese pairings with Accolade Wine School, the Diner's Club VIP lounge, cocktail making and a hot dog party taking place in front of the Taste fire pit. Restaurants making their debut this year are Nonna Tonda, serving delicious handmade pasta dishes, Rohit Ghai's highly anticipated new Indian restaurant, Kutir, which opens a couple of weeks before Taste, Jamie Oliver's home of smoke and fire, Barbecoa, and authentic Malaysian cuisine from Papparich. On Saturday night DJ BBQ serves up hot dogs and takes over the decks at The Fire Pit for a two-hour DJ set. Plus there are over 100 food and drink stalls to shop at including handmade Burley Fudge, organic Beronia Wines, award winning Cornish Cheese Co. and Pleese Cakes. The perfect way to kick off the festive season. The wonderland returns to south London for its second year. A magical wonderland takes over Hyde Park for a winter of festive fun and games. Throughout late November and December a large area of Hyde Park near Hyde Park Corner is transformed into a Winter Wonderland, complete with fairground rides, giant wheel, circus, Christmas market, food and drink stalls, Santa's grotto and, of course, an ice rink. 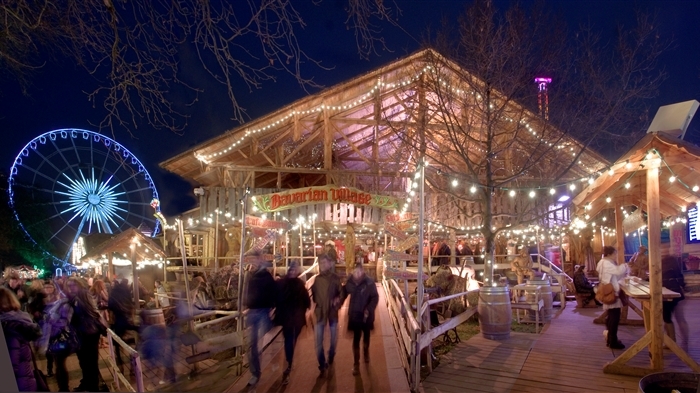 Now in its eleventh year, Winter Wonderland has become a favourite in many Londoners' calendars. There's a huge choice of things to do from the ice rink to the Magical Ice Kingdom where you can go on a Deep Sea Adventure. Other popular features are the 53-metre-high Observational Wheel, Zippos Circus - always a hit, especially when temperatures plummet - and traditional Christmas Market with wooden chalets and Bavarian-style bars and cafes. (Remember: advanced booking on the main attractions is advised while you'll need to buy tokens from kiosks dotted around the fair for the many rides.) Additionally, new to this year is The Snowman Experience with Backyard Cinema. Celebrating 40 years of the classic festive book, the experience will bring the story to life through a multi-roomed, multi-sensory adventure. Free entry to the site means you can just walk around and absorb the festive ambiance - but it will take a strong will not to succumb to the smells and fun on offer. This Christmas market boasts a scenic backdrop. One of London's most picturesque festive markets, Christmas by the River is back for its fifth year in 2018. Taking place in London Bridge, the market, housed in wooden huts, boasts a backdrop of lovely London landmarks including Tower Bridge, the Tower of London and City Hall and brings together over 50 stalls selling gifts, food and drink. Get ready for Christmas and join in with the free workshops on everything from food and drink tastings to glittery arts and crafts and storytelling. The street is transformed with over 60 craft stalls and boutique sellers. As part of Belgravia's Christmas celebrations, which will also see Father Christmas come to the area, Elisabeth Street will once again be transformed for the Belgravia Christmas Sunday. Turning the street into a magical wonderland on Sunday 2nd December, there will be more than 60 handmade craft stalls and boutique sellers providing the chance to enjoy some festive Christmas shopping. The day will also offer children's entertainment, choirs, brass bands and seasonal food and drinks. A pop-up weekend market of fashion, food and foliage. This Christmas, HemingwayDesign curates SAMPLE a pop-up market of fashion, food and foliage at Greenwich Peninsula, held over the weekend of Saturday 1st and Sunday 2nd of December. A late night food and drink market runs on both of the days, accompanied by live music, performances and DJ sets, while the days also bring the opportunity to purchase clothes, homewares and designer goods. This year's traders include Cakehole, Coco & Ginger, Edy & Bridge, Kimba and Woben Form. Additionally, jewellery designer Tatty Devine has created a public art installation as a unique alternative to the traditional Christmas tree. The Rainbow Halo features a rainbow archway sprinkled with jewelled stars created to represent themes such as love, peace, unity and joy. Over 400 exhibitors bring a taste of rural England to London. The village is transformed into a winter wonderland with fairground rides, food stalls and entertainment. This December, Hampstead Village is hosting its very own Christmas market and fair. Pedestrianising Hampstead High Street for one day only, the Hampstead Village Christmas Fair will transform the area into a winter wonderland with street food stalls, traditional fairground rides, live music and a Santa's grotto, complete with reindeer. Craft stalls will provide the chance to purchase some unique Christmas gifts and a special Festive Trail will highlight the area's best shops and attractions with mini gifts and prizes to be won. The atmospheric market hosts a series of special festive night markets. Located in the Victorian railway arches in Bermondsey, Maltby Street Market is an atmospheric spot year-round, but it's stepping things up a gear this winter with a series of festive night markets. Making the most of the beautiful Dickensian setting, the arches have been decorated with beautiful festive lights and the market traders will serve everything from mulled wine to mince pies. There will also be Christmas carols and food from the likes of Waffle On, The Beefsteaks and Herman ze German. The market runs on Fridays from 4pm to 9.30pm. From cheap budget places to stay to luxury 5 star suites see our deals for hotels, including Grange Blooms Hotel London from 57% off.